Tom Johnson is one of the tagged sharks the team will follow during the expedition. 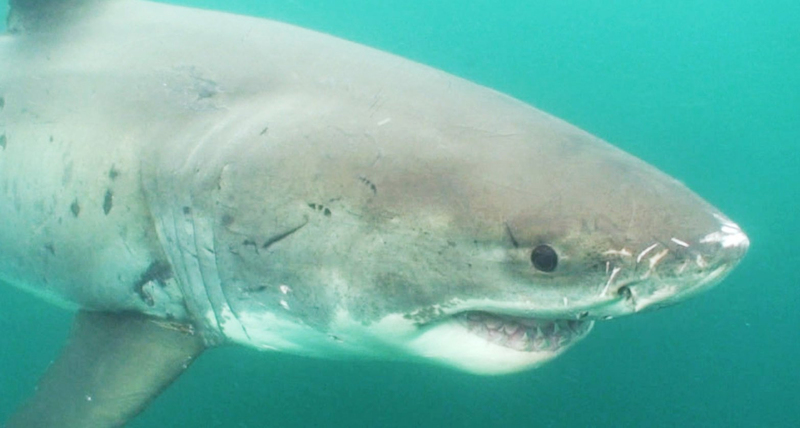 He is the oldest and longest studied white shark in the world. Image courtesy of the Voyage to the White Shark Cafe 2018 . Download larger version (jpg, 381 KB). From April 20 - May 19, 2018, the NOAA Office of Ocean Exploration and Research’s Dr. Amanda Netburn will join a multidisciplinary team of oceanographers, marine ecologists, and molecular biologists aboard the Schmidt Ocean Institute’s Research Vessel Falkor on a journey to an open patch in the Pacific Ocean known as the “White Shark Café” to study one of the most iconic predators in the ocean: The white shark. Using electronic tags to track shark migrations, Principal Investigator Dr. Barbara Block and her team at Stanford University’s Hopkins Marine Station, along with colleagues from the Monterey Bay Aquarium, have found that a large number of white sharks that forage each fall in the waters off California migrate annually to an open ocean region halfway between Hawaii and the Baja peninsula in Mexico. It is unclear, however, why the sharks leave bountiful food along the central California coast and migrate to a remote oceanic desert about the size of Colorado. It is thought that they may either use the area for mating or that there may be a deep-sea foraging ground there. During the fall of 2017, when the sharks were close to shore, Dr. Block and her team fitted 37 white sharks with satellite tags. Once the Falkor is on location in the Café, these tags will provide the researchers with the sharks’ locations. The scientific team will also use advanced research tools, including Saildrone, an unmanned surface vehicle; an autonomous underwater vehicle (AUV); CTD sensors; remotely operated vehicle (ROV) SuBastian ; trawls; genetic tools (environmental or E-DNA); and more to survey the water column in this region to understand why the sharks transit there. Dr. Netburn will be contributing to the midwater trawling and ROV surveys in order to quantify the potential prey field to test the hypothesis that there is a deep-sea foraging area here. By combining tools to study the biology and behavior of the sharks with those to document the biological, physical, and chemical oceanography of the region, scientists can, for the first time, begin to assemble a picture of the role the White Shark Café plays in these animals’ life histories. This information is fundamental to making decisions to best protect white sharks in the high seas. With several days of transit from both Hawaii and the mainland U.S., the deep exploration of the water column in the White Shark Café will also contribute baseline information of a highly underexplored region of the ocean. To learn more about the expedition and to follow the cruise log while the team is underway, visit: https://schmidtocean.org/cruise/voyage-white-shark-cafe/ . And follow the Schmidt Ocean Institute on Facebook , Twitter (@SchmidtOcean , #WhiteSharkVoyage), and Instagram (@schmidtocean ) for updates throughout the mission.